Say goodbye to multiple apps and complicated software. Syncro’s RMM works in-sync with the PSA to make your job delightful. 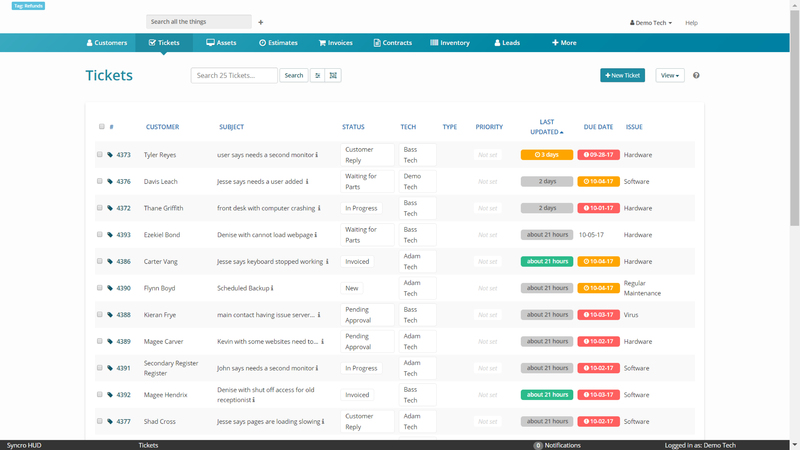 With real-time Monitoring and customizable Notifications, you can choose what issues are surfaced so you can quickly focus on identifying and fixing critical situations. Identify, diagnose, and fix issues – fast. 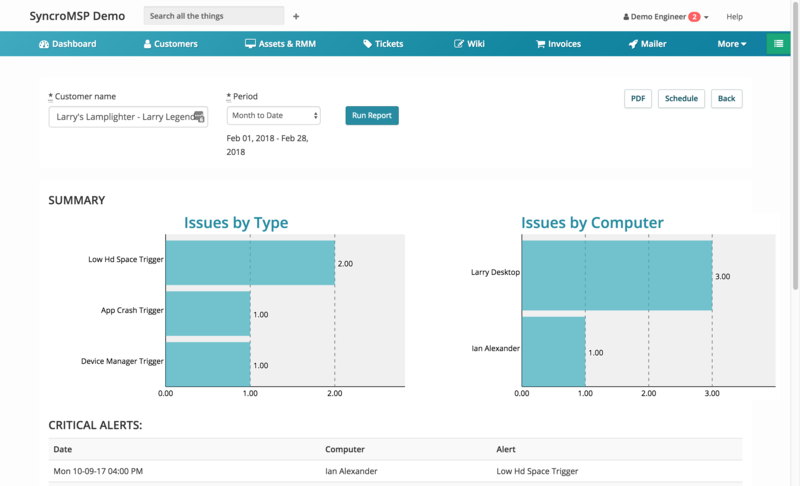 Between comprehensive Monitoring, real-time Alerts, and an extensive set of Maintenance tasks, you’ll fix issues before they even become your client’s problems. With built-in communication tools and a dedicated Portal for each client, you can offer better communication while automating a majority of the messages. 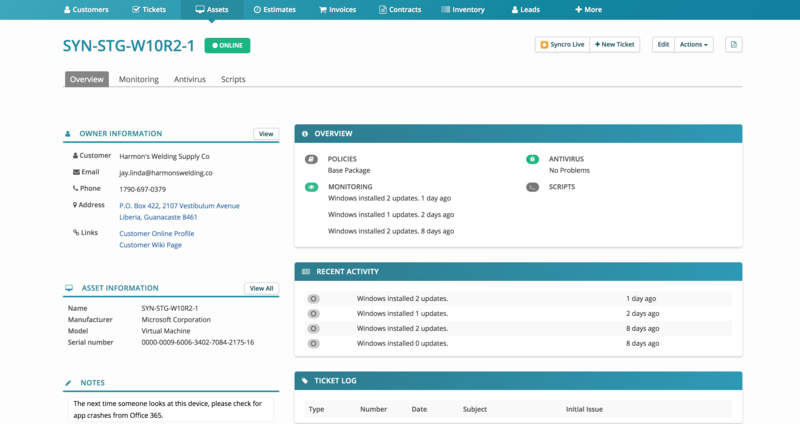 Built-in MSP reports enables you to maintain line-of-sight to your entire network’s performance, while also letting you dive into details of each client’s environment. 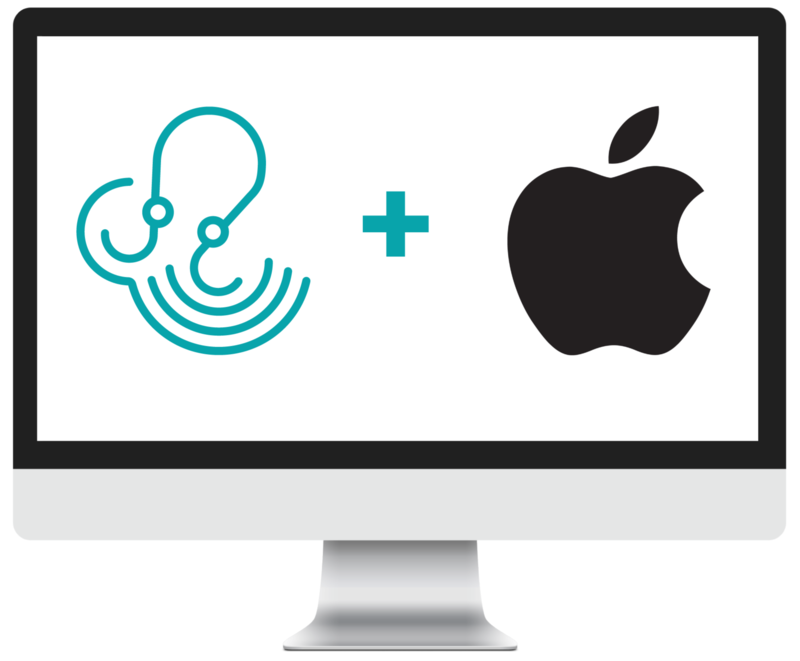 We are currently developing a version of Syncro’s RMM agent that is compatible with Apple Mac devices. You’ll be able to service your clients with Mac devices and further consolidate your workflows with Syncro. This functionality is now in Private Beta! If you’d like to test the Syncro Mac Agent, email us a request at help@syncromsp.com to join the Private Beta. 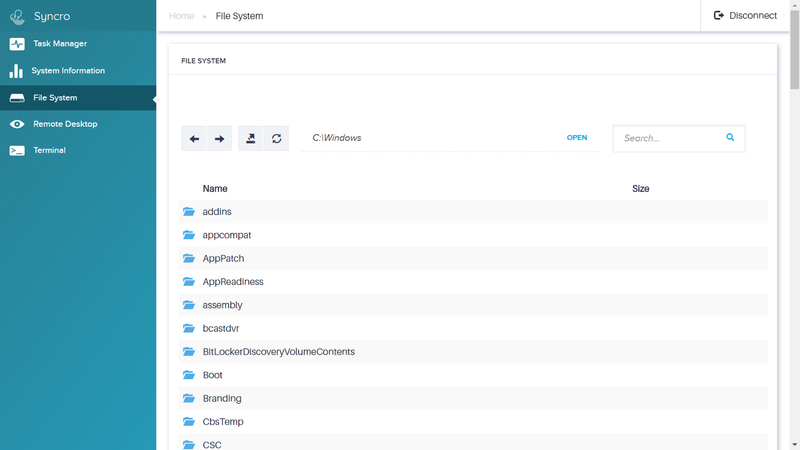 The Community Script Library is a place to view a library of valuable scripts created by both the Syncro team as well as your fellow Syncro user community members. Scripts help your processes become super efficient and with the Community Script Library, there is no need to re-invent the wheel, you can simply borrow it from other techs! Check it out and please submit scripts of your own. 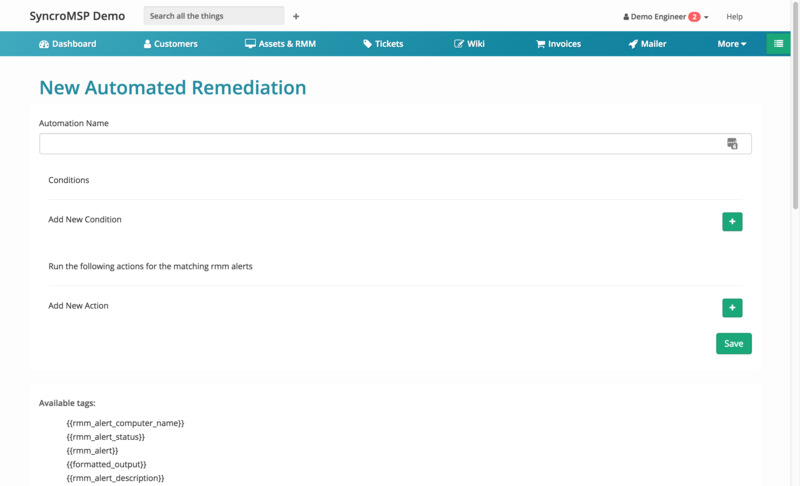 Set up Automated Remediations to automatically perform actions when an RMM Alert is created, such as creating a Ticket, sending an SMS message to a technician, and more! Create automated workflows that allow you to build powerful efficiencies for your business. 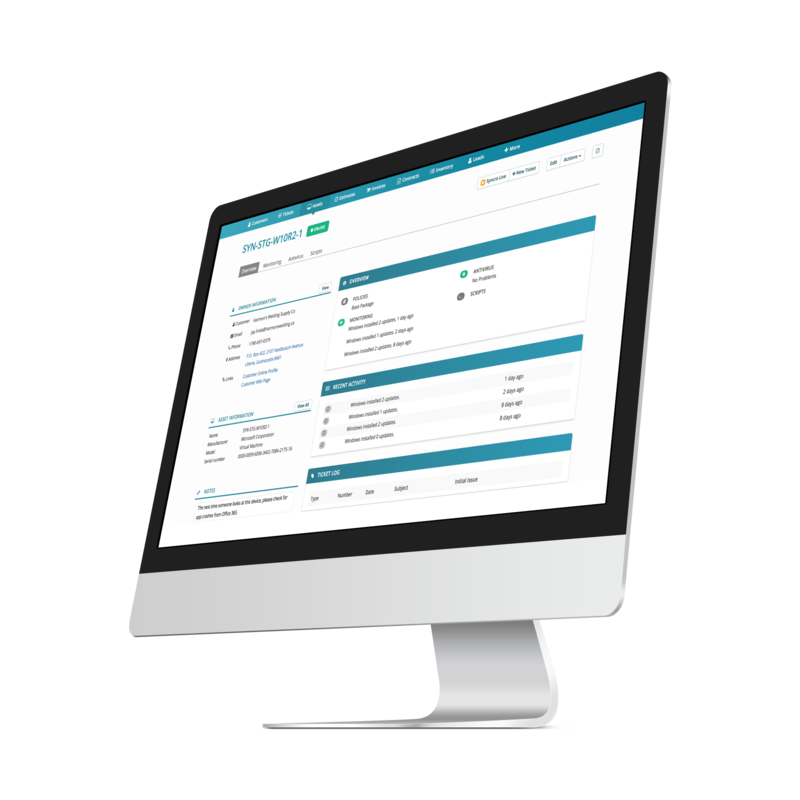 Use our RMM Reporting functionality to quickly gain insights about a client’s frequent issues, critical alerts and more. Generate client-facing Reports automatically, pick the time frame you’d like to report on, and schedule a recurring report to be emailed to your client directly on an interval of your choosing. Customize report text to help your client get the most out of the information in the report as well. Monitor devices for common issues with confidence and receive notifications in real-time when they occur – all from one cohesive web-based dashboard. Offer clients iron-clad security and unbeatable peace of mind. You can now use Syncro in conjunction with Bitdefender. 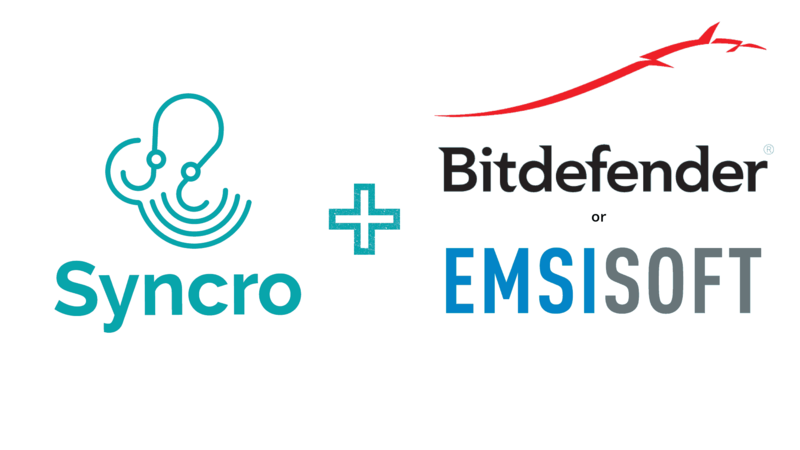 Our additional Anti-Virus integration features the award-winning solution by Emsisoft. 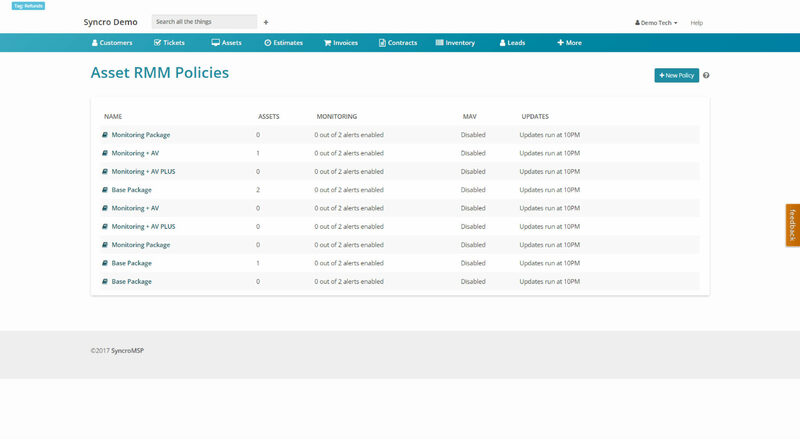 Quickly install and update 3rd party applications on devices using Syncro Policies. 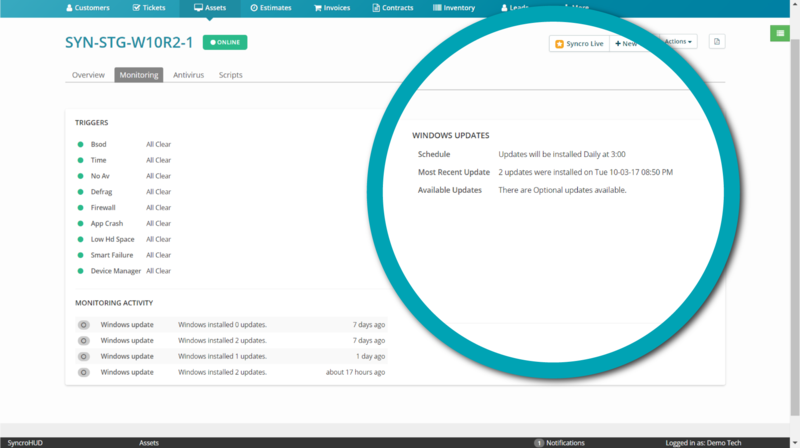 Manage installations or updates in batches across multiple client devices and rest easy knowing client machines are always up to date. Monitor Windows Update Service and apply updates easily to ensure your customers are up-to-date and protected from vulnerabilities. 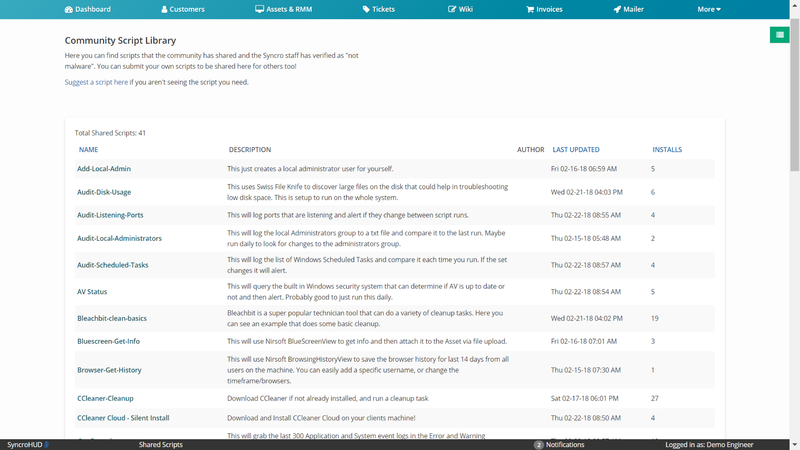 Use PowerShell and Batch scripts to automate tasks on your clients’ devices. 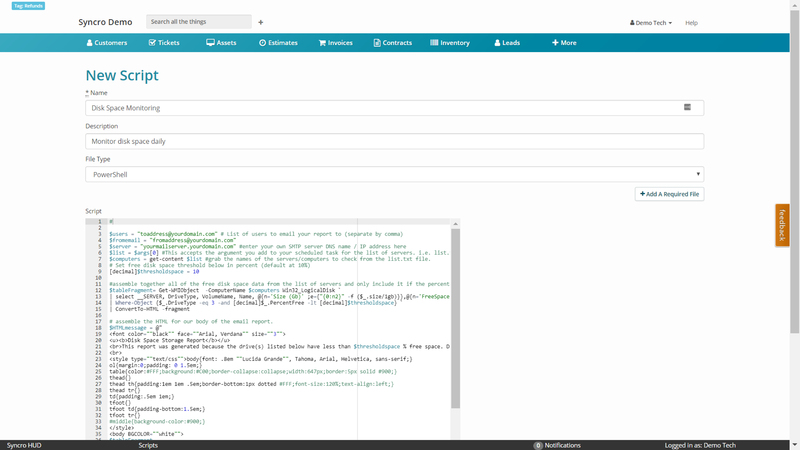 Upload your own custom scripts or choose from scripts in our library. 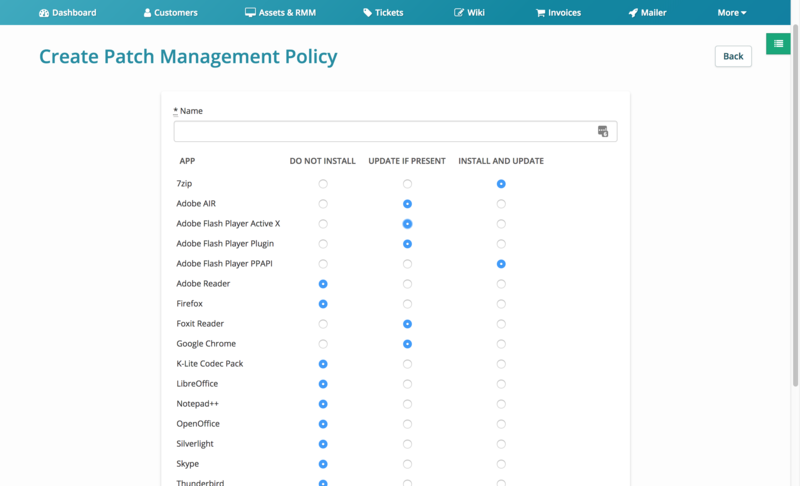 Streamline device management with Policies to change settings and preferences in bulk. Easily make global changes to devices and feel like a genius while doing it. File Explorer enables you to easily upload and download files on a remote computer. Use Syncro Live to easily start unattended remote access, remote command prompt and PowerShell, file upload/download, process control, task manager, and more. Go beyond data points and find true business insights in Syncro’s extensive analytics suite, including a dashboard designed to report information key to your MSP business. Syncro can also produce and schedule a variety of client facing reports so you can keep your clients well informed. Your PSA and RMM are now best friends within Syncro’s fully integrated platform. 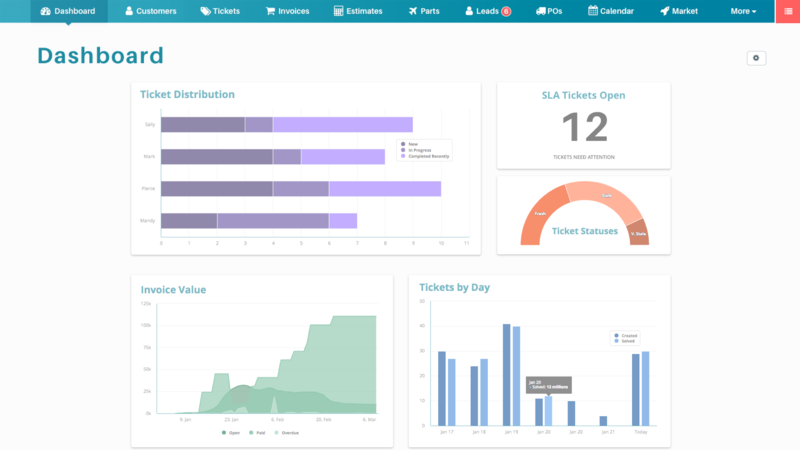 RMM monitoring and alerts connect directly to a robust ticketing, invoicing, and billing system to streamline your business from end-to-end.